hammers/shanks/flanges/knuckles/back checks, new wippens strings and dampers, new pins, bushings, punchings, new key tops. All Steinway parts. Action was just regulated, hammers voiced and case was given an French Polish so it looks and plays great. Comes with Warranty. 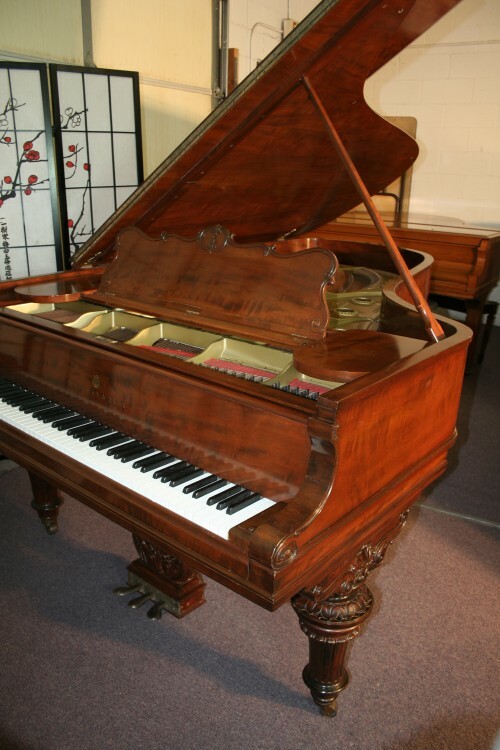 Specializing in delivering used/pre-owned Steinway’s and other used/pre-owned brand name pianos to: Boston MA, Glendale AZ, Little Rock AK, Boulder CO, Norwalk CT, Dover DE, Naples FL, Savannah GA, Boise ID, Chicago IL, Indianapolis IN, Des Moines IA, Wichita KS, Louisville KY, Honolulu HI, New Orleans LA, Portland MA, Ann Arbor MI, Gulfport MS, St. Louis MO, Omaha NE, Reno NV, Manchester NH, Milwaukee WI, Newark NJ, Jacksonville NC, New York City NY, Fargo ND, Cleveland OH, Portland OR, Philadelphia PA, Providence RI, Columbia SC, Sioux Falls SD, Nashville TN, Houston TX, Midland TX, Salt Lake City UT, Charlottesville VA, Charleston WV, Madison WI and the rest of the USA and WORLDWIDE!